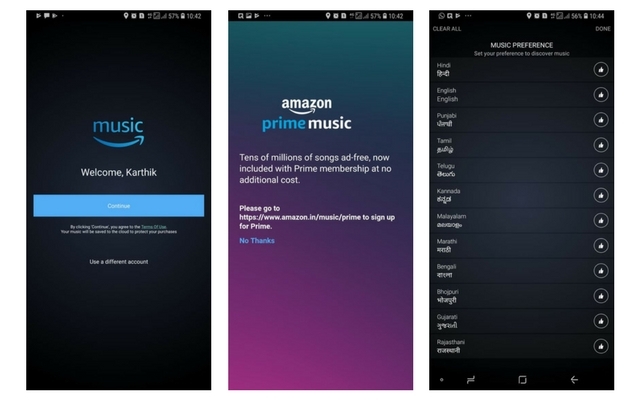 Amazon has finally launched its music streaming service called the Prime Music in India. This news doesn’t come as a surprise considering the fact that the company has been making constant efforts to tie up with popular music labels in the country like Saregama, T-series, etc. The Amazon Prime Music service is now available for download from Google Play Store and Apple App Store. However, it is worth making a note that the music streaming service is only available for Prime users in the country. The subscription is available for Rs. 999 for a year. Talking about the app itself, it comes with a plethora of features. First off, we have the Alexa integration. With this integration, you can simply talk to Alexa and ask for songs, albums, artists and more. The app is also ad-free which means that you won’t be interrupted with promotions between songs. You also get to pick and choose the languages of your choice. There are 12 languages including English, Hindi, Punjabi, Tamil, Telugu, Marathi, Bengali, Malayalam, Kannada, Bhojpuri, Gujarati and Rajasthani. One also gets access to hundreds of curated playlists and stations across genres, moods, activities, decades, and artists. You can head over to the supported list of devices to see if you have any compatible devices. With the launch of Prime Music in India, Amazon is now set to go head-to-head with other music streaming services like Gaana, Saavan, Wynk Music, Apple Music, Google Play Music, Hungama and more.